James Shurts, the new COO of TRIBINE Harvester discusses the new T1000 harvester and his excitement of being at TRIBINE. James highlights the T1000 production machine benefits, how TRIBINE solves many issues facing the industry, and the future of TRIBINE. The new TRIBINE T1000 recently seen in Texas harvesting wheat. The video shows the TRIBINE’s tight turning radius and wide distribution of the grain chaff. The all new TRIBINE will be harvesting at Farm Progress and Husker Harvest this Fall. TRIBINE can unload a full load of grain, over 1000 bushels, in 2 minutes. Filling a whole semi truck at over 500 bushels per minute is a clear benefit to farmers. These speeds are enabled by significant improvements in the distribution of power, operator control, and auger systems in the TRIBINE vs. conventional harvesters. The full load of the TRIBINE is supported by Titan LSW tires which flex and spread the load while maintaining speed and maneuverability. With a 1000 bushel grain tank capacity the Tribine can make many field rounds without stopping and unloads at over 500 bushels per minute. 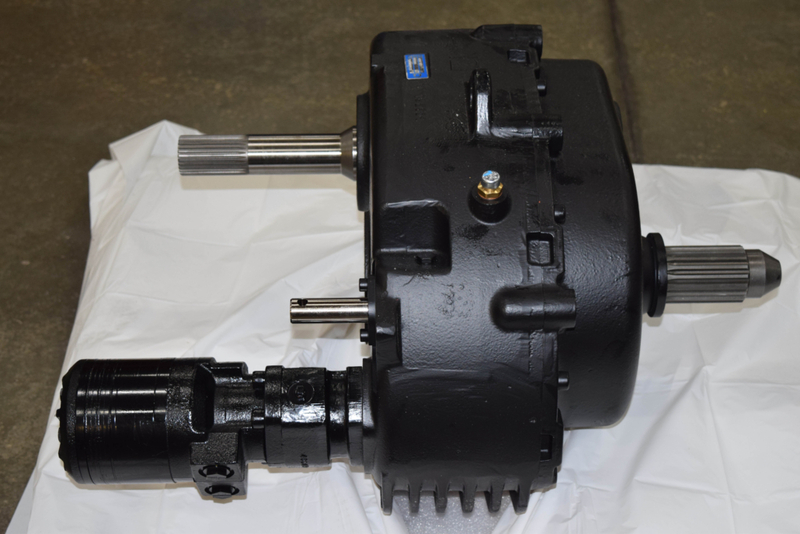 This unheard of capacity in the industry may eliminate the need for tractor and grain cart in many operations. 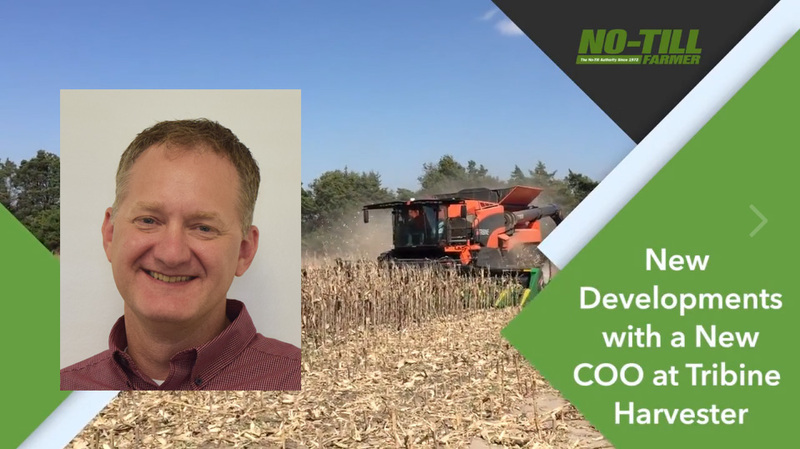 A reduction in capital and operating costs are an ideal solution to make no-till profitable in the corn belt. Just two tracks per field pass and full time all wheel drive. The articulated and crab steering makes the Tribine nimble, with turning circle radius less than most other combines today. The 500 gallon fuel capacity seamlessly integrates into the harvester resulting in the Tribine being able to operate for 24 continuous hours without refueling. An innovative new cab was designed for operator comfort, intuitive control of the harvester and unprecedented visibility. 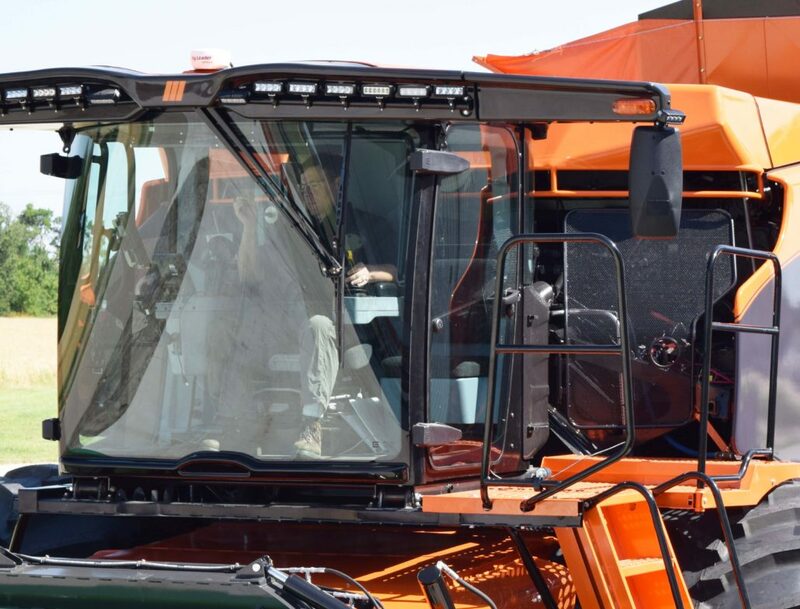 By removing the steering wheel and replacing it with a single steering joystick control, the comfort of the operator is improved and precise maneuverability of the harvester is enabled. In the steering column area, the glass cab floor provides unrestricted visibility down towards the header and field. The ladder in front of the wheel allows easy access with a spacious walkway for hinged door entry. To further assist the operator, the LED lighting throughout enables 24/7 operation. Wrapping around the front edge of the cab, the Tribine illuminates everything in its path. This lighting combines with operator control cameras and the extra large side mirrors, to provide 360 degree operation visibility. 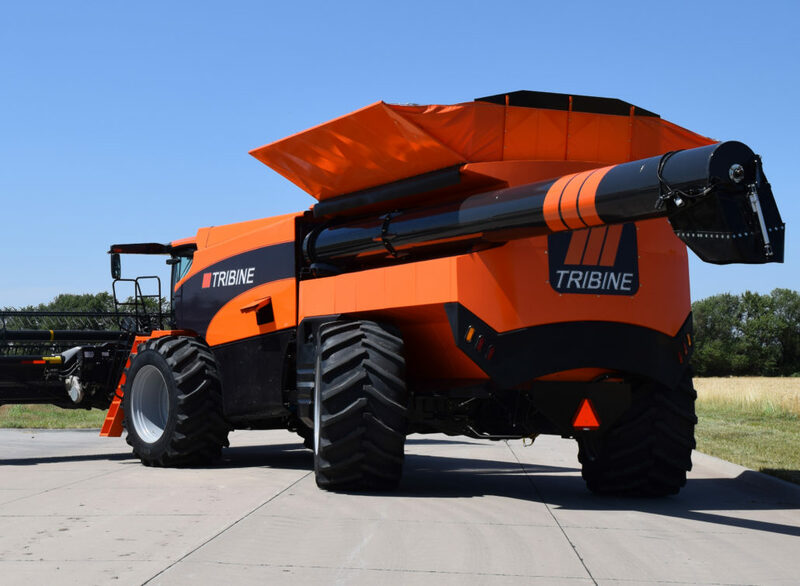 The Tribine carries grain in the rear module, allowing much more room directly behind the cab for a revolutionary new cleaning and threshing system design. 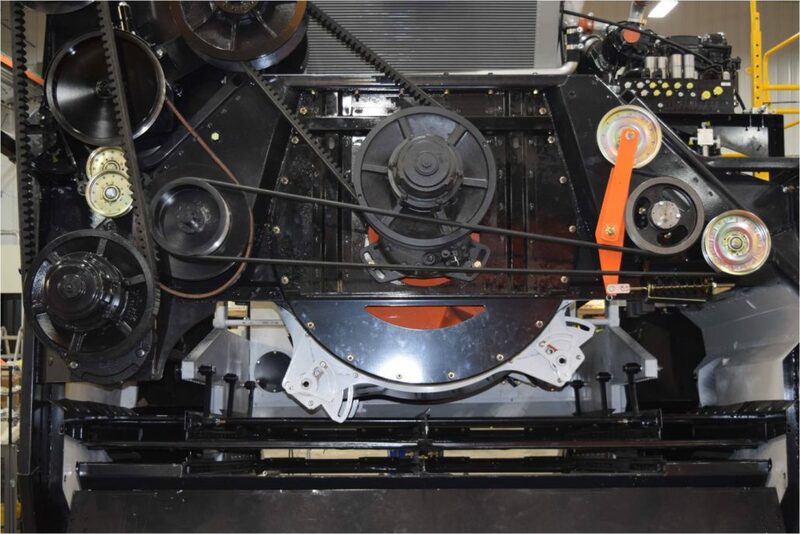 The cleaning area is significantly wider than other combines and is assisted by advanced pneumatic methods for removing the chaff from the grain. The rotor has a swung diameter of 38 inches, and the concave/grate wrap around it is designed to use 270 degree of the cylindrical surface area, providing much larger separation area than other single rotary machines in today’s market. 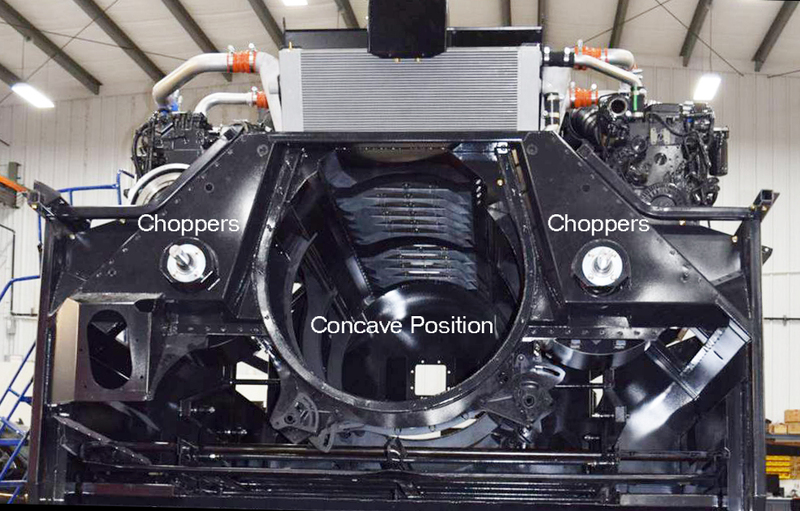 With up to twice the cleaning area of any other harvester, these features produce separation, cleaning, and very high throughput. The dual engine design ensures dedicated power is always available to run these systems in the highest of yields and toughest of conditions. After the clean grain is separated, two side discharge choppers propel the finely chopped chaff out from the Tribine, for a swath width up to 50 ft. This provides better field distribution of residue, for faster decomposition and return of nutrients back into the soil. Tribine residue management components will finally provide the much needed answer to wide headers and residue problems that go with them, while consuming much less of your harvesting horsepower.